Some themes support Basic Customization. This feature, allows you to easily change some basic layout details your Knowledge Base uses, like links and body colors. If you can see it, it means you can easily change basic layout configurations. You only need to change those fields and click on Apply and your Knowledge Base will have its layout updated. 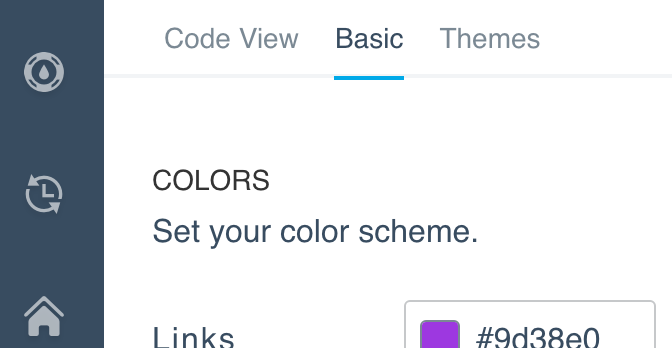 In this example, $links_color is a SASS variable and it will be set to the color selected in the Basic tab. $back_image_url: The URL to the image uploaded for the Header Image field. It defaults to a Helpjuice provided sample image. Missing values (like a blank color field) will cause Main CSS to fail validation. You won't be able to save it.